Spring is the season that asthma and allergies suffers dread the most due to triggers such as poor air quality and high pollen count. The 2014-15, the Australian Bureau of Statistics, National Health Survey reported that approximately 2.5 million Australians live with asthma. Looking at the 0-14 year age range they found that a massive 12% of boys and 9% of girls have asthma. As you read this you may be thinking of a child you know with asthma, you may have a one yourself. An exciting new study from the Chinese University in Hong Kong found that regular yoga practice had a positive impact on the quality of life of asthma suffers. Kid’s yoga and mindfulness can help as a complementary therapy and an alternative to standard breathing exercises. Through the practice of asana and pranayama, yoga can complement conventional medications to assist in reducing the symptoms of asthma and frequency of attacks. Yoga postures can help air flow more freely through the bronchial tubes and air sacs in the lungs. 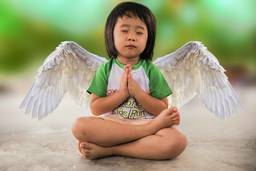 For children who find it harder to inhale, forward bends and lower back bends such as Downward-Facing Dog, Bridge or Bound Angel pose may be beneficial. Inversions are a great way to shift excess mucus from the lungs and balance out the immune system; they’re also fun to do. Most age groups can practice Supported Shoulderstand or Legs Up The Wall. Both Downward-Facing Dog and Bridge pose are inversion too. The Three Part Breath or Dirga Pranayama teaches children to breathe into the three parts of their abdomen; the belly, chest and throat. This controlled breathing technique regulates and deepens the breath enabling more oxygen to get into the body. The muscles in the lungs can become stronger and it stabilizes the nervous system. Psychologically, practicing yoga and mindfulness can assist children to manage their feelings and emotions, helping to reduce anxiety. They build awareness of their body and learn to pick up early warning signs of asthma flaring up. Many children can feel self-conscious about using their inhaler in front of others. Yoga develops an openness to accept ourselves as we are. Self-compassion is developed, confidence grows and the impact of asthma on social wellbeing is reduced. If you have a child with asthma and would like to start a regular yoga and mindfulness practice, please seek medical advice first. For more information about how yoga can help kids with asthma, please contact the expert contributor.